Why doesn't Yale-NUS release its financial reports? Why doesn’t Yale-NUS release its financial reports? Unlike many colleges and universities that publish their financial reports online, Yale-NUS College does not release its own financial statements. There is little public information regarding the College’s finances. According to Pericles Lewis, President of Yale-NUS, Yale-NUS’s financial reports are subsumed under National University of Singapore’s (NUS) financial reports. He also said that there are no future plans to release more detailed financial reports of Yale-NUS. Yale-NUS is an autonomous college within NUS. This means that although the College is “autonomous in [its] governance and has full control over [its] curriculum, policies and finances”, it is not a separate legal entity from NUS, Kristen Lynas, Executive Vice-President (Administration) said in an email interview. Thus, while the College consolidates its own financial statements, it does not publish these reports, she said. These reports are shared with the Governing Board and the Ministry of Education (MOE). “I think there’s an aspect of not wanting to draw too much attention to all the details of every financial arrangement,” Mr. Lewis said. The parliament asks questions regarding the College’s spending and the College releases the relevant information but “we don’t release more information than we’re required to,” he said. Both Yale University and NUS publish their annual financial reports on their websites. Yale has financial reports from the financial year 2002-2003 and NUS has reports from 2003-2004. These financial reports typically contain a summary of the university’s assets and liabilities, endowment and funds, income and expenditure, as well as an auditor’s report for the financial year. Yale-NUS College hopes to transition to a phase where operating revenue is composed of one-third government subsidy, one-third tuition and fees, and one-third gifts and endowments by 2030. Students interviewed expressed a variety of opinions regarding the disclosure of school finances. Ng Hui Lin ’19 said that she supported a stronger push towards transparency because transparency fosters trust among the community, which is currently suffering from a hushed attitude towards finances. “If [the College] want[s] to make all these big sweeping claims about how everyone in Yale-NUS is a family, [it] need[s] to start walking the talk,” she said. Ng also said that she felt that the College should disclose the annual breakdown of funding for each office so that students know what resources they have to work with. Yale-NUS’s gifts were not disclosed in the 2016 report. He added that students should concern themselves more with information pertaining to issues that affect them personally, such as student organization funding and travel funding. Further, he said that students should do so by paying closer attention to the work of the Student Government. Svetlana Kekutiia ’19 said that she did not have a strong opinion as she did not have enough information regarding school finances due to the College’s general lack of communication. She added that in addition to not releasing financial information, the College does not release the SAT scores of the incoming classes. “I’d like them to release at least some information,” she said. 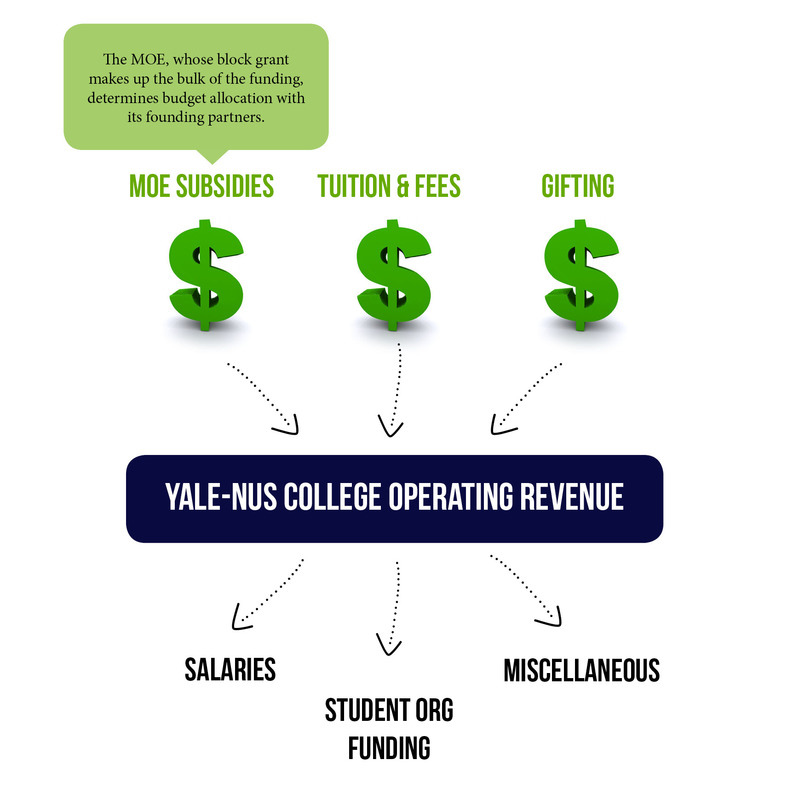 According to interviews with Mr. Lewis and Ms. Lynas, Yale-NUS College’s operating revenue comprises of government subsidies, endowments and gifts, and tuition and other fees. Slightly over half of the College’s funds goes to salaries of staff and faculty members; the rest is devoted to other costs such as study abroad, student organisations and research. Financial aid constitutes about ten percent of the school’s budget, Mr. Lewis said. Yale-NUS Finances: What do we know? As of March 2016, Yale-NUS’s total endowment stands at S$365 million. According to the NUS 2015 Annual Report, Yale-NUS received around S$8.4 million in gifts in 2015. The College is currently mainly funded by an MOE block grant, but hopes to transition to one-third government subsidy, one-third tuition and other fees, and one-third gifts and endowments by 2030, shifting reliance away from MOE. The College builds its endowment through fundraising from government agencies, foundations, faculty, parents and future alumni. Budgeting is determined by founding partners in collaboration with the MOE. About 10% of the school’s budget is spent on financial aid, for which around 50% of the student population is eligible. The College has been staying within its budget and demonstrating a surplus. After The Town Hall: Now What?